Goulish greetings to you all! I'm glad you arrived for this delightful occasion and hope you have dressed in the appropirate attire. Please take a sip if you dare! Today I am sharing with you my Royal Albert Regal Series teacup and saucer. This black teacup has a lovely gold cascade overlay that is quite striking. 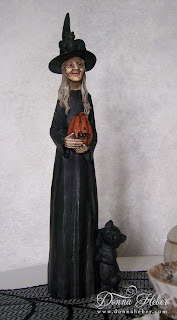 A Halloween witch will watch over us during the witching hour. Is there a full moon this evening? Don't be afraid of the dark. 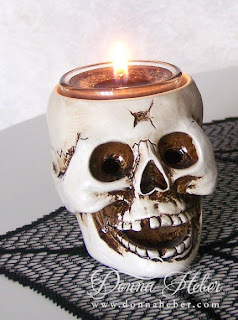 A spooky Yankee Candle skull tealight holder will light the way. Our scent tonight is Witches' Brew. 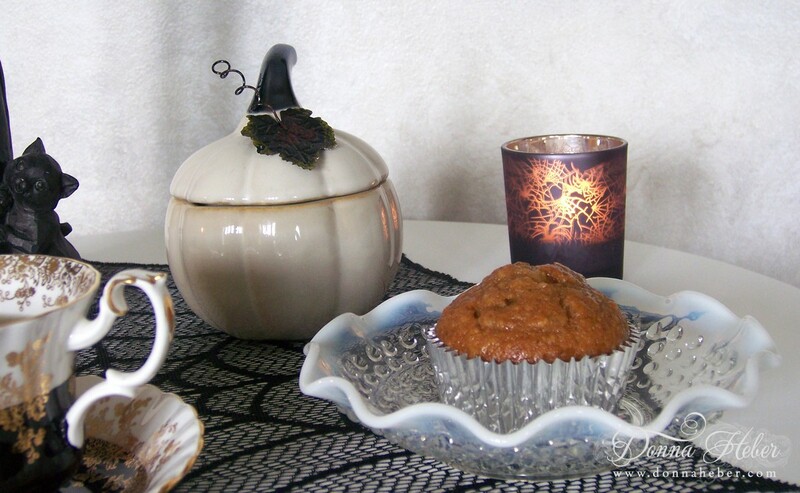 The spicy sweet aroma of exotic patchouli casts a captivating Halloween spell. Would you like a scrumptious apple cinnamon muffin for a sweet treat? 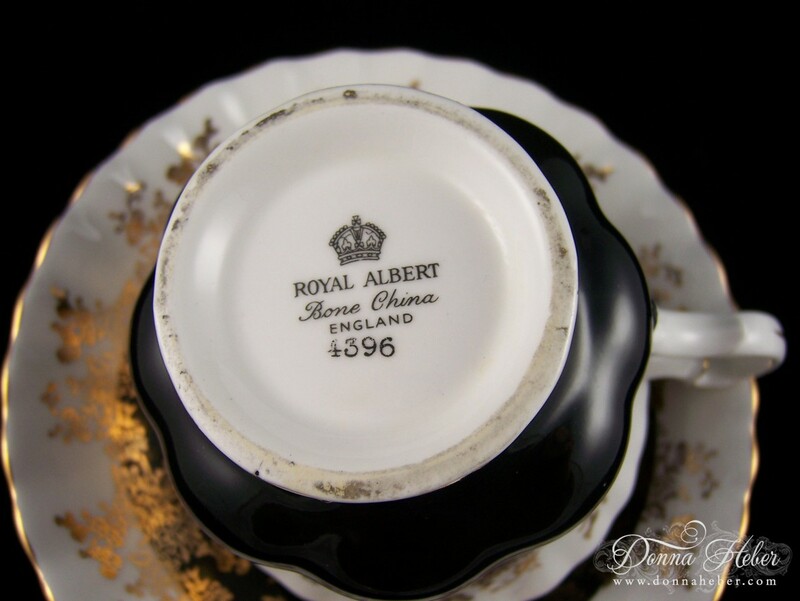 Let's take a peek under the teacup. 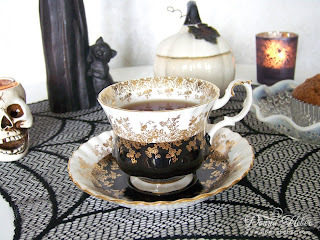 Thank you for joining me for some Halloween tea. I am linking with the following ladies this week. what a fantastic tea cup. Love the black and golden design and this is perfect for Halloween. Wish you a Happy Halloween. That teacup is gorgous...love your Halloween tea setting. what a beautiful decoration, I love your witch she is fabulous. and your teacup is very beautiful. 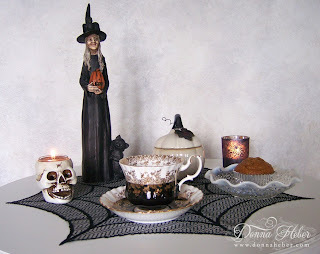 Very nice Halloween table setting! I love the witch! Beautiful.... Halloween is my 2nd fave decorating holiday and this is stunning!!!!! 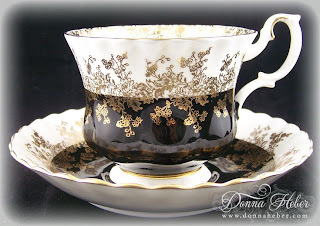 That is a very pretty tea cup and I love the colors. What a spooky setting! !